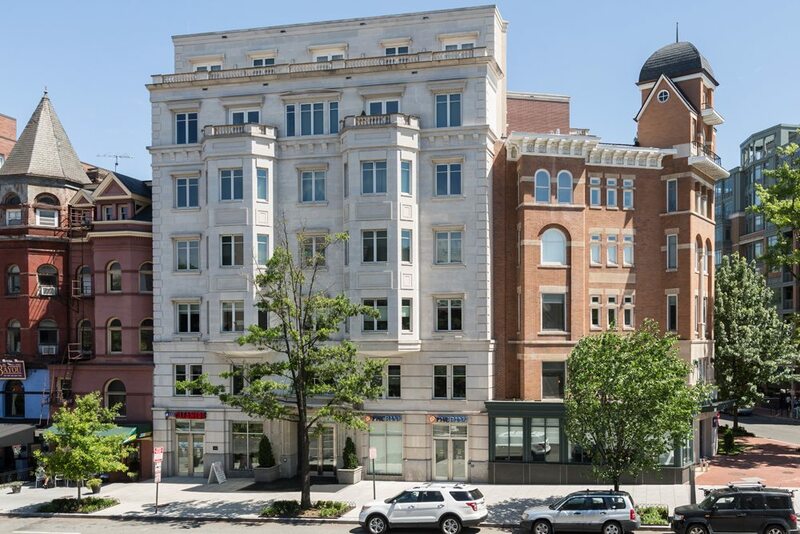 Offered at 2501 Pennsylvania Avenue, Penthouse 2B presents 4,500 magnificent sq. ft. of pure magnificence on two levels. It is the largest condo among the 16 in a former 19th Century office building once called The Luzon. 2501 is a A Life At The Top “It” Building. Take the private elevator into a long gallery, one of many distinctive touches of renown designer Barry Dixon. A stunning backlit onyx wall surrounds the living room fireplace in glowing light whether there’s a fire burning or not. This is a home that provides thoughtful comforts everywhere including dark hardwood floors; high, coffered ceilings; large rooms flooded with abundant natural light. Dixon dressed the library in deep dark browns, sumptuous fabrics and wall treatments, and built-in bookshelves. A dramatic island with breakfast bar serves as a kitchen focal point. Appliances are top-of-the-line. Another Dixon trademark touch is a custom curtain that separates the kitchen and family room for privacy when occasion demands. Graceful and grand, a curving staircase invites access to the second level where three bedrooms await. His and her walk-in closets in the master suite are beautifully appointed. The master bath offers a Zen-like experience with a luxurious shower, deep soaking tub with jets, and expansive vanity with double sinks, all finished in statuary marble for timeless appeal and style. Two more bedrooms have their own ensuite baths. And a balcony with monument views is shared by the master and one of the secondary bedrooms. Penthouse 2B features private outdoor spaces including two main level balconies plus a long terrace with monument views off the second level shared by the master and one of the secondary bedrooms. Just eight stories tall, 2501 Penn was transformed by Intrepid Real Estate into the ultimate and intimate boutique building in a location where three of the city’s most highly desirable neighborhoods converge — West End, Foggy Bottom and Georgetown. The fashionable West End has become one of the glitzier places in the city to live — home to corporate lawyers, doctors and wealthy retirees, as well as international visitors and guests of the Ritz-Carlton Hotel and Residences, the Park Hyatt and Fairmont hotels. Residents enjoy walking to myriad restaurants, theaters, shops, parks, Trader Joe’s and the new Soul Cycle. For dining, look to Juniper, West End Bistro, Rasika West End, Blue Duck Tavern at the Park Hyatt, RIS at the Ritz, Circle Bistro and Hudson. Penthouse 2B at 2501 Penn is offered at $6,950,000. Come take the tour.